To a blender add all ingredients mentioned in "GRINDING" section.Add 1/4 cup of water and blend to a smooth paste. Set aside. Once POT is hot add Bay leaf, onions and saute until onions turn light brown for 2 minutes. Add the prepared coconut-cashew paste, red chilli powder, turmeric powder, garam masala , curd(yogurt) and Stir continuously for 2 minutes until raw smell disappears. Now add the veggies ,salt and water and combine well. Close the lid on the pot, and turn valve from VENTING to SEALING position.Press CANCEL button on Instant Pot. 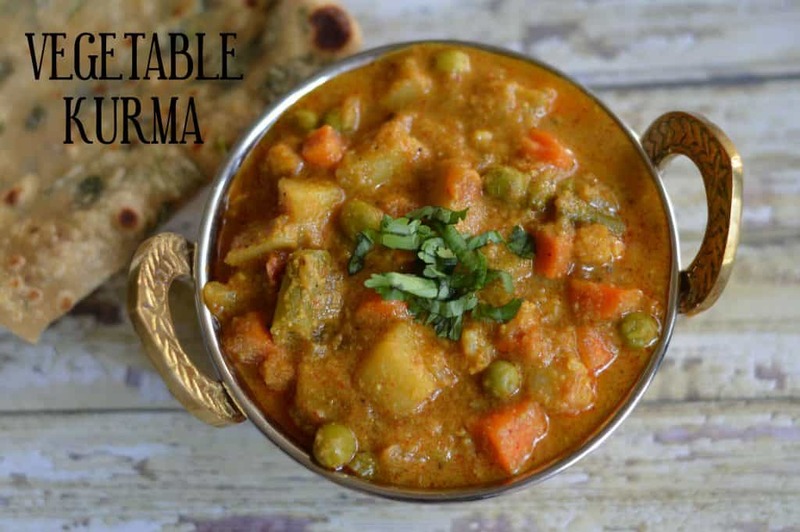 Vegetable Kurma is ready, serve with hot with pooris, chapatis, roti & parathas. Take a Pressure cooker ,add oil in to it.Once hot add Bay leaf, onions and saute until onions turn light brown for 2 minutes. Close the lid ,place a whistle and cook for 1 whistle on medium flame. Take a kadai/pan ,add oil in to it.Once hot add Bay leaf, onions and saute until onions turn light brown for 2 minutes. Now add the chopped veggies ,salt and water and combine well. Cover the kadai with lid , cook on medium-low heat for 15 minutes.Make sure veggies are cooked well.Stir in between.TIP you can also use pre-cooked veggies saves cooking time. Remove lid , add lime juice and garnish with cilantro.Mix well. 1.Vegans can skip yogurt or use vegan yogurt. 2.You can use veggies of your choice.You can also use beetroot, broccoli, bell pepper ,chow-chow. 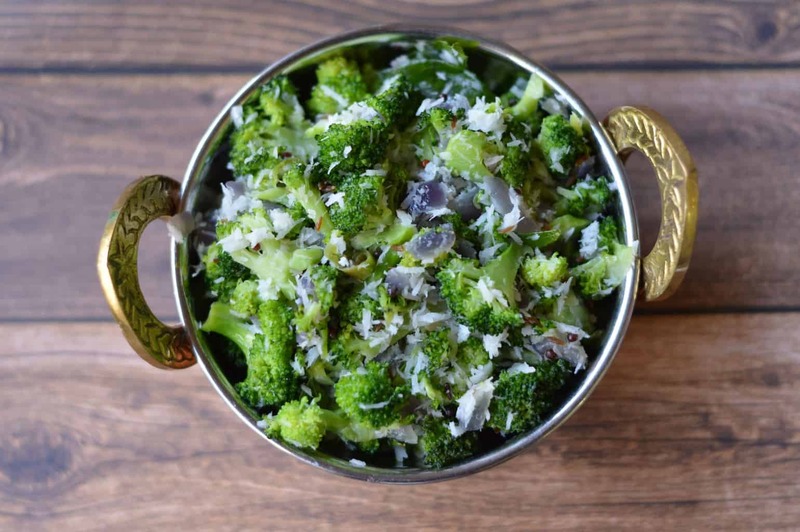 3.If you do not have fried gram(roasted chana dal), replace with 1 tablespoon of cashews or poppy seeds. Cashewnuts helps the gravy to be more creamier and tasty. 4.If you dont find whole spices replace with required amount of garam masala available from grocery stores. 5.Also adjust the chillis according to the spice level. 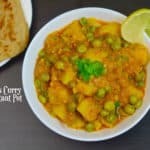 Palak Paneer is a dish of North Indian origin consisting of palak (spinach) and paneer (cottage cheese) in a thick curry sauce based on pureed spinach and garam masala. Prepare spinach puree by adding spinach into the blender with little water and keep aside. Once POT is hot add cumin,ginger-garlic,green chili,onion and saute until onions turn light brown. Next add tomato and cook for 2-3 minutes or until tomatoes turn soft and mushy.Keep stirring else it may stick to the POT. Add the spinach puree into the tomato and onion paste and give a quick stir. Add little water if gravy is too thick. Then add garam masala powder,coriander powder,salt and mix well. Then add cream and the paneer and mix well.No need to boil/saute again after adding paneer. Delicious palak paneer is ready. 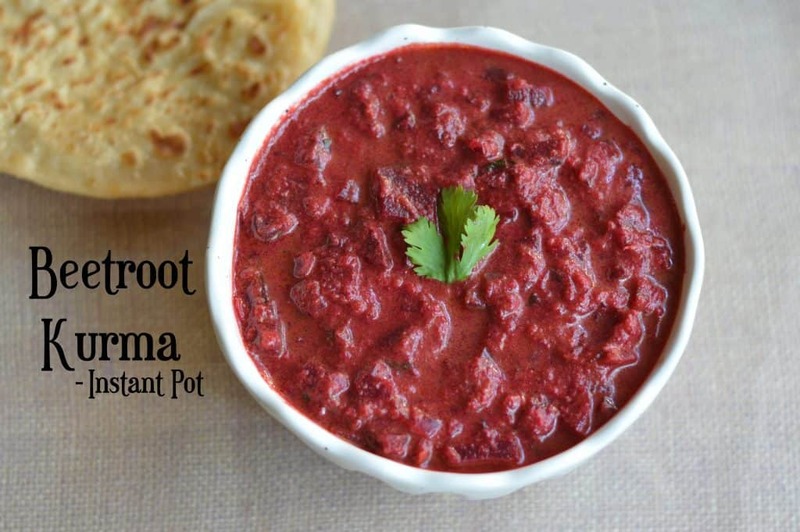 Serve it with your favorite Indian bread variety (roti / naan / kulcha / paratha) or even plain rice. 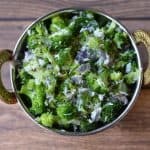 Blanch spinach/palak for 3-4 minutes and put cooked spinach into cold water for 30 secs to retain green color.Prepare spinach puree by adding cooked spinach into the blender with very little water and keep aside. Once the oil is hot, add cumin/jeera,ginger-garlic,green chili and saute for 30 secs until raw smell of ginger garlic goes away. Then add onion and saute until onions turn light brown. Add the tomato and cook for about 2-3 minutes or until tomatoes turn soft and mushy. Then add garam masala powder,coriander powder,salt and mix well.Boil for 2-3 minutes.Note Just cover the pan with a lid to avoid spinach from splattering all over.Do not over cook. Add the cream to the spinach gravy and then add the paneer cubes. Mix well. 1.Vegans can replace cottage cheese/paneer with Tofu. 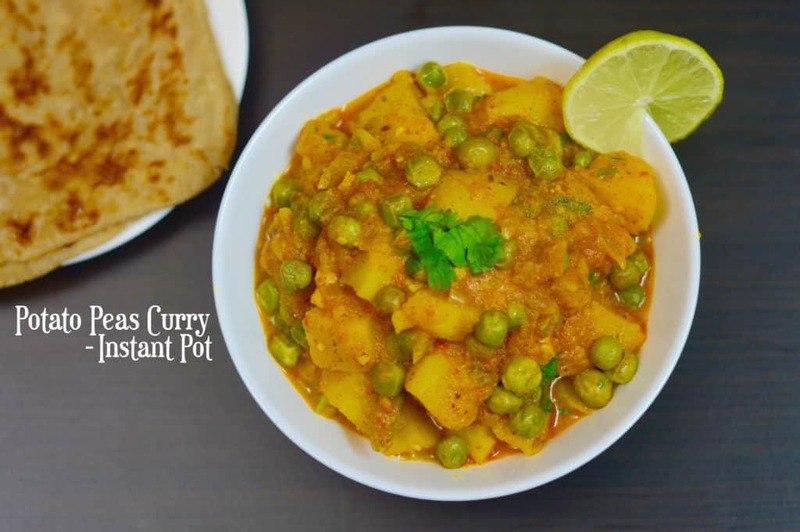 2.If you dont have paneer or tofu you can also add cubed potatoes along with spinach puree and pressure cook for 2 minutes in INSTANT POT. 3.You can also skip tomato and instead can add 2 tablespoon of curd for sourness. 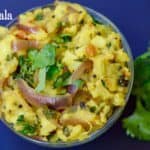 Jhunka Vadi Recipe is a traditional dish from North Karnataka and Maharashtra prepared using gram flour, onion and spices. 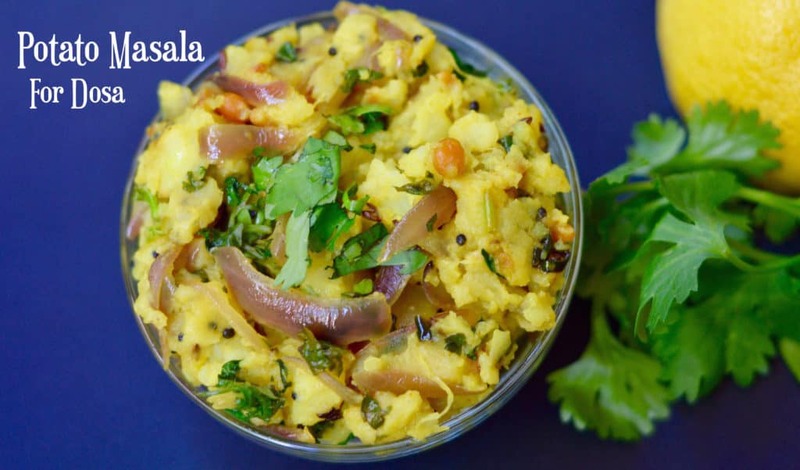 This tasty dish is used as an accompaniment with chapathi or Jowar Roti(Jalada rotti). Mix together besan/gram flour and water to make a smooth paste(lump free) and keep aside. Heat the nonstick sauce pan with oil, add mustard & cumin seeds.Allow them to splutter. Add garlic,green chilies, curry leaves,hing/asafoetida and saute for 30 secs. Add onions and fry till they turn light brown and tender. Add turmeric powder,tamarind juice ,jaggery & stir for few minutes(appx about 1-2 minutes). Add salt,besan mixture cook on low heat and stir continuous so there will be no lumps. Cook till mixture leaves sides of the pan and the besan mixture gets a shiny texture. Once Jhunka mixture has thickened ,turn off the heat. Transfer the mixture to greased rectangular pan/tray and spread the mixture evenly. Sprinkle some fresh coconut and coriander leaves.Let it cool completely. Cut the mixture into square or diamond shapes. 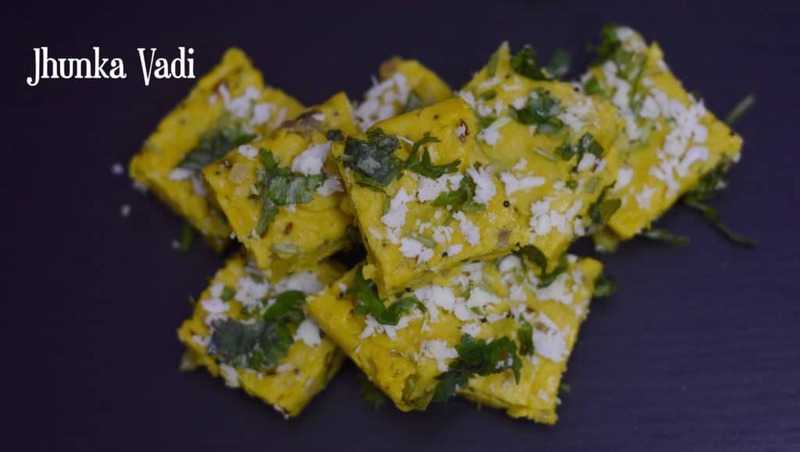 Jhunka Vadi is ready and can be served with Bhakri / chapati or just can be eaten as a snack. 1.When the jhunka starts to thicken make sure it don't stick to bottom. So keep on stirring.Also use thick bottom pan or Nonstick pan. 2.You can skip tamarind juice and replace with lemon juice. 3.You can make Vadi size of your choice.some prefer thin and some prefer thick. 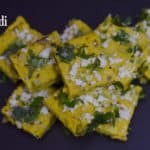 4.You can also shallow fry the vadi and have it as a tea time snack. 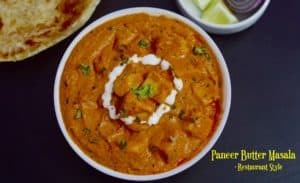 Here’s an easy recipe for the perfect restaurant style paneer butter masala for all you paneer (cottage cheese) lovers! Put the onions,tomatoes,cashew nuts,ginger, garlic,spices and 1 cup of water into a pan and bring to a boil. Cook on medium flame for at least 15-20 minutes. Remove from the heat and cool. 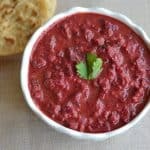 Blend to a smooth puree/paste. In a pan, heat the oil,butter,add the jeera and saute for 30 seconds. Add kashmiri red chili powder,bay leaf,give a quick stir. Then add onion-tomato pureed mixture.Close lid and cook on a medium heat for 2-3 minutes. Add the paneer, kasoori methi,garam masala,salt.Mix well and bring the mixture to boil. Finally, gently stir in the cream and paneer butter masala is ready to serve. Serve hot with chapatti, naan,rice and onion slices. 1.You can also freeze onion-tomato puree/paste(makhani gravy) and make paneer butter masala when you have less time for cooking. 2.If you think gravy is too thick add water or milk accordingly. 3.Adding fresh cream gives a rich taste to the gravy ,incase you do not have cream at home then replace with 1/4 cup of full fat milk. 4.You can also shallow fry paneer and add to the gravy. 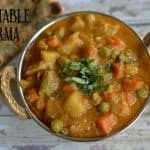 Potato Masala, is an Indian dish made with yellow potatoes, sautéed onions, and a tasty blend of spices and fresh chilies. Keep the pan/kadai for heating and add 1 table spoon oil, once oil is heated add mustard seeds,cumin,urad dal,chana dal and fry it till dals become light brown.Then add green chillies, curry leaves and fry it for 30 secs. Now add onion,turmeric powder,salt and fry it for 2-3 minutes or till onions turn soft. Add Boiled & mashed potato and mix it well, close the lid and cook for 2 minutes.Turn off the flame. Now add coriander leaves, squeeze lemon juice and mix it well. Instant Pot Whole Green Moong Dal is a vegan Indian recipe where Mung/Moong bean dal (lentil) is cooked with spices! Press saute mode on Instant Pot. Add oil and once it's hot add cumin seeds. Let them crackle. Add ginger-garlic paste,saute till the ginger-garlic turns golden brown. Then add tomatoes and cook for 1-2 minutes ,till tomato turns soft. Now add soaked moong dal ,water, and salt give a stir. Press CANCEL button on Instant Pot,Set the pot to manual (High Pressure) and set timer to 3 minutes (for firmer moong beans) or 5 minutes(for softer,broken up moong beans). Remove lid away from you,add cilantro and lemon juice. Also adjust consistency of the dal at this point. 1. If you dont have time to soak lentils,You can still make this dish by setting timer to 15 minutes on the INSTANTPOT with (Quick Pressure Release) and for 3/4 cup of dry green lentils add 3 cups of water. 2. If you don't have garam masala, Add half teaspoon each of cumin powder and add half teaspoon of coriander powder. 3. If your dal is watery,you can turn on the saute mode and cook for another 2-3 minute in the end. 4. No onion/no garlic variation: You can take out the onion and can replace garlic with a pinch of asafetida/hing. Wash and rinse the dal,keep aside. Press saute mode on Instant Pot. Add ghee and once it's hot add cumin seeds. Let them crackle. Add chopped garlic, green chili,curry leaves and saute till the garlic turns golden brown. Then add chopped tomato and mix. Cook for a minute. Add turmeric powder,salt,red chili powder and cook the tomato mixture for 1-2 minutes ,till tomato turns soft. Add chopped spinach and cook for another 2 minutes. Now add the rinsed dal ,water,garam masala and give a stir. Cancel Saute mode,Set the pot to MANUAL/PRESSURE COOK (High Pressure) and increase timer to 10 minutes. Once the pot beeps, let it release the pressure naturally(NPR) for 10 minutes (Wait until silver button on lid drops). Spinach dal is ready and serve hot with boiled rice,quinoa. 1. If you don't have garam masala, Add half teaspoon each of cumin powder and add half teaspoon of coriander powder. 2. If you are in a hurry,Once 10 minutes cooking time is up and you hear a beep, wait few minutes (5-6 minutes) and then release the pressure by yourself ..you would still see same results as above. 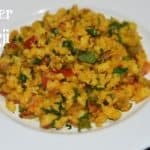 Paneer Bhurji Recipe – Quick & Easy Recipe.I often make this for Paneer Bhurji Sandwich or Roti.You can use either store brought Paneer or Homemade. Paneer bhurji is ready and can be served with roti,naan,rice.